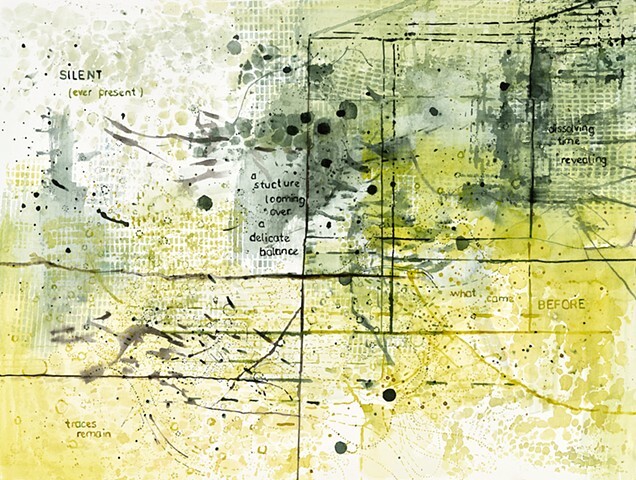 between Place and Thought opens at shift gallery, during Pioneer Square First Thursday Art Walk, February 7th, 5 - 8 p.m. The show runs from February 3 - March 2, 2019. Gallery hours: Friday & Saturday 12 - 5 p.m. or by appointment. 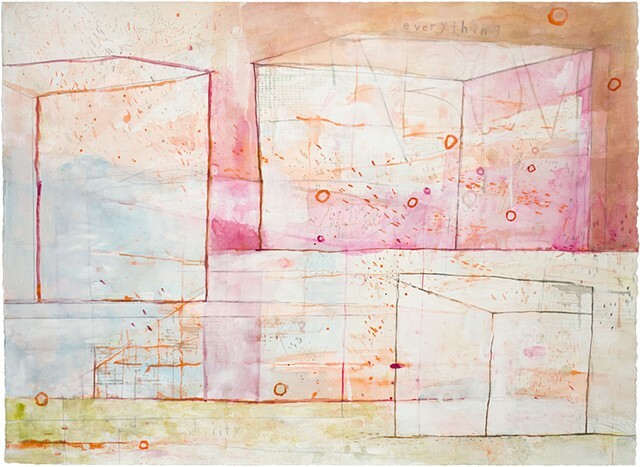 This series of watercolor paintings is on view until February 3, 2019, at Front Seat, located at 915 E. Pine St, Suite 401 in the historic Oddfellows building in Capitol Hill Seattle. The gallery at Front Seat is curated by Laurie Kearney at Ghost Gallery. The work is available online - ghostgalleryshop.com. Join me for the artists' reception on Saturday, August 18th from 5pm-7pm for at the Columbia City Gallery: 4864 Rainier Ave. S.
Artists were chosen by local jurors, Dawna Holloway (Studio e, Director), Naomi Ishisaka (Photographer and Journalist), Elisheba Johnson, (Public Art project Manager for the Seattle office of Arts and Culture). 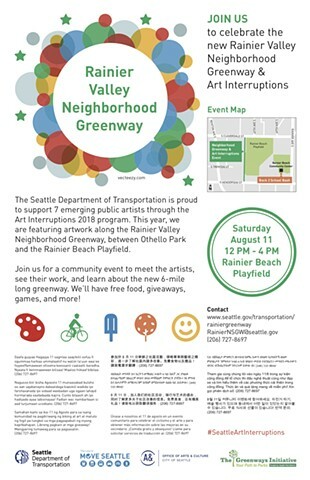 There's a celebration for the new Rainier Valley Greenway and Art Interruptions this Saturday, August 11th from noon-4pm. The artists will be on the west side of the Rainier Beach Playfield. My street graphics are installed on the sidewalks and some of the wheel-stops along 46th Avenue between S. Kenyon Street and S. Cloverdale. More maps! 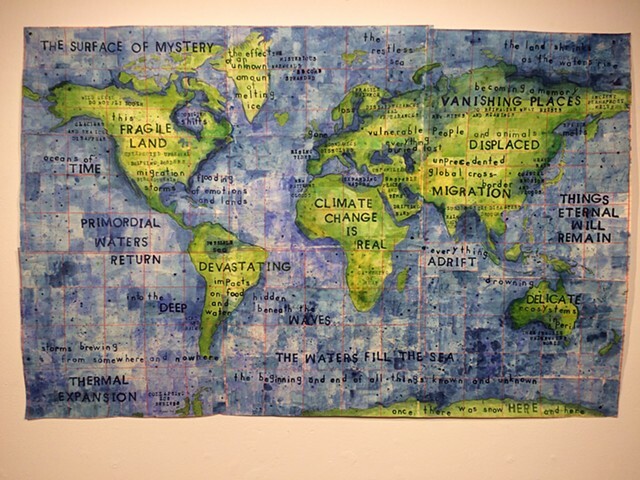 After visiting me at the opening reception for "A Portable Homeland" at A-Gallery on May 3rd, during the Pioneer Square First Thursday Art Walk — walk around the corner to see "You Are Here, Too" at '57 Biscayne curated by Jane Richlovsky and Annie Brule, with Mesker Maps. 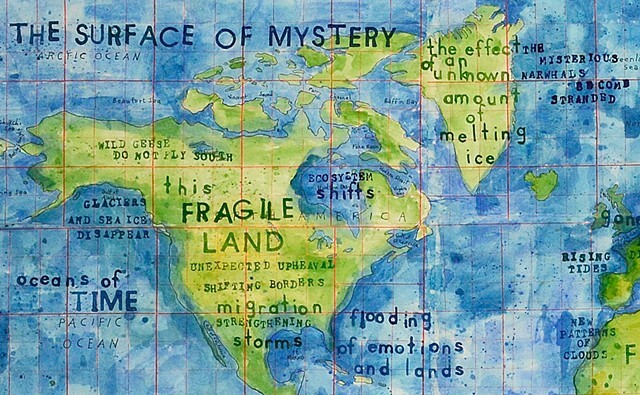 The show is an homage to maps, map-making, and cartography by an impressive and diverse group of PNW artists (two of my maps are in the show including the map pictured above). The show will be on display through August 30. I’m honored to have the opportunity to show “Climate Change is Real” in LA as part of a group show about the guilt of our generation. How can my generation and the generations that came before me say to our children and grandchildren "we could have done more to stop climate change" and not feel guilty? Guilty Parties, The Gallery @The Braid, Santa Monica, CA. 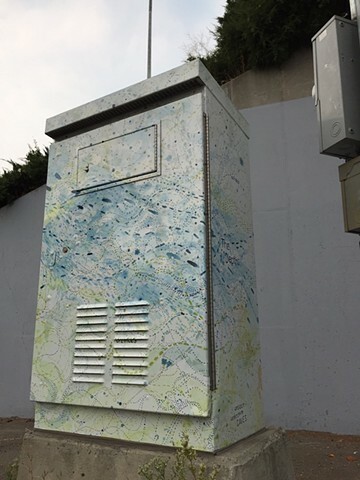 The piece is on display from May 5-June 10, 2018. I am honored to be invited to show at the Inscape Arts and Cultural Center gallery, 815 Seattle Blvd S, Seattle, WA. I hope you can join me at the opening reception: Thursday, January 4th, 5-8pm. Other gallery hours for the show: Fri. Jan. 12th from 12-3pm and Sun. Jan. 14th 2-5pm or, by appointment. 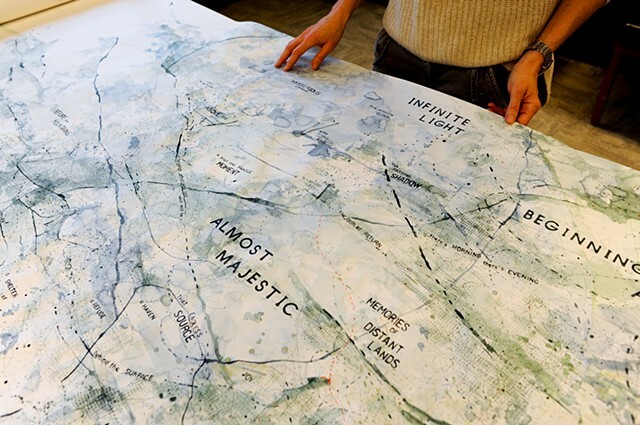 If you can't make it in January, this is a work in progress and I plan to create another three to four feet of this map before showing it again in May/June in the A Gallery in Pioneer Square. That opening will be on May 3rd, 5-8pm. 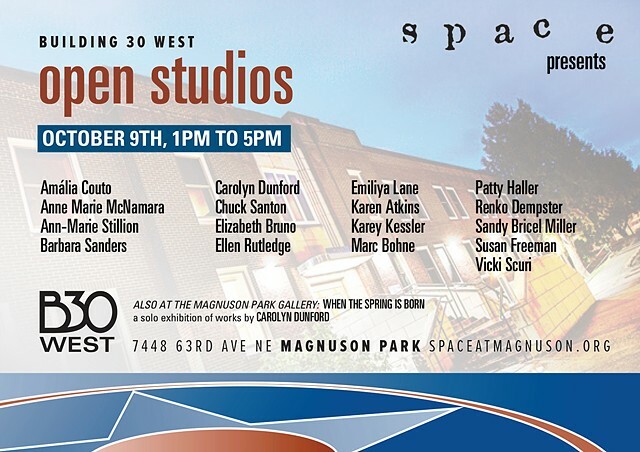 My studio, along with the studios of the other artists of Building 30 in Magnuson Park will be open to the public on Sunday, November 5, from 2:00 p.m. - 6:00 p.m.
Also that Sunday in the building, the Magnuson Park Gallery celebrates the opening of its first annual selected works exhibit of Building 30 artists, Art is the Only Choice. The exhibit features one of my works along with 25 other artists working in Building 30 and is on view during regular gallery hours through December 16, with all works for sale in time for holiday gift giving. 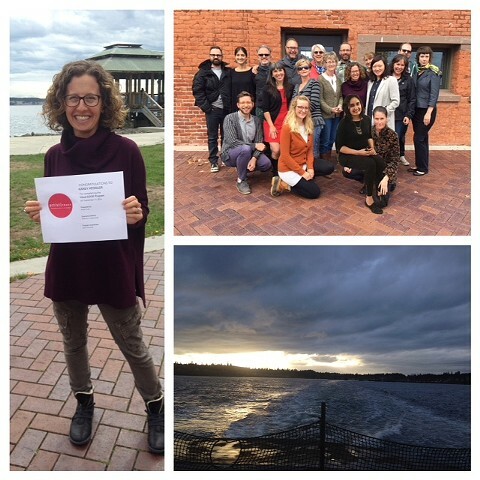 The Magnuson Park Gallery is operated by Sand Point Arts and Cultural Exchange (SPACE), a non-profit dedicated to building community and facilitating arts and cultural activities for the public within the park and the Sand Point Naval Air Station Historic District. 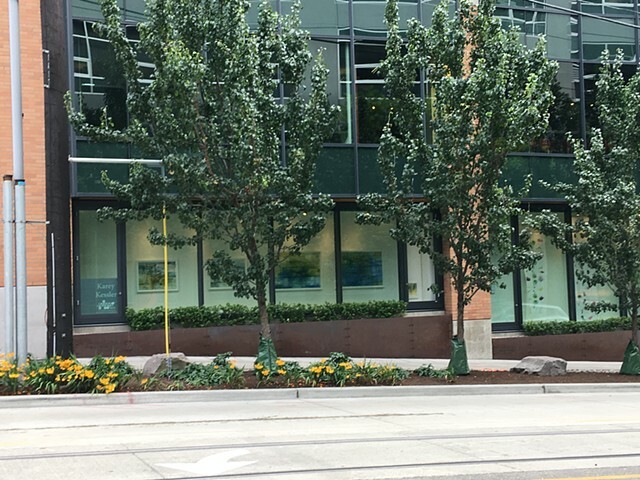 My Storefronts installation is composed of recent works on paper that use the image of scaffolding and abstract structures to reflect the rapid development in Seattle (particularly in South Lake Union), and the iconic image of the sky scraper as the symbol of capitalism. 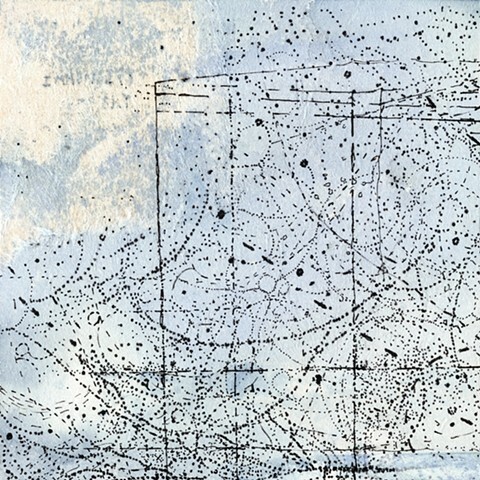 The work also explores the idea of an imagined invisible scaffolding that holds up the universe, and an intangible essence that flows between the more familiar structures of the visible world. 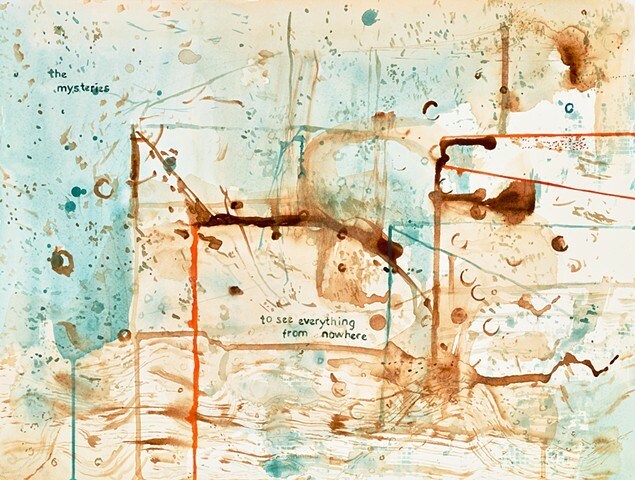 The work hovers somewhere between poetry, painting, and maps. Please join me for a FREE Art Walk on Monday September 25th. Each Storefront artist, including myself, will give a talk infront of their public art site. We will meet at the corner of John and Boren (right next to Thai Thani Kitchen) at 6pm. No need to register. Just show up! Happy hour to follow at Ballard Pizza Co. SLU. Seattle Art Fair is August 3-6 with hundreds of galleries from all over the world in the Century Link Field Event Center, and shows spread at galleries throughout the city. That week-end, two of my paintings will be in a juried charitable art show at the Bemis Building, from August 4-6, benefiting Facing Homelessness. The show is called "Unity at the Bemis." 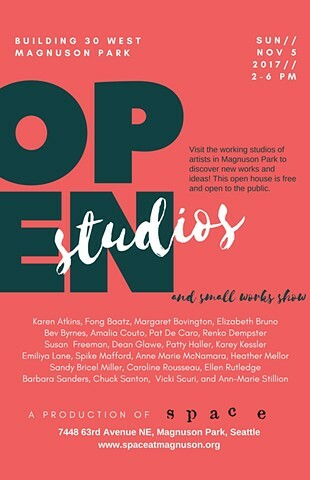 And, my work will be on exhibit at the Inscape Building which is having Open Studios on Saturday August 5th. My painting, "a delicate balance" is included the CoCA member's show, Make America Create Again. The exhibition opens during the Pioneer Square Art Walk on April 6th from 6-9pm. Just finished the week long EDGE Professional Development Program at Centrum located in Fort Warden Park, Port Townsen, WA. The program was created by Artist Trust an amazing non-profit in Seattle that supports artists in their creative journeys. I have a lot of information to digest and lots of new friends to keep in touch with!